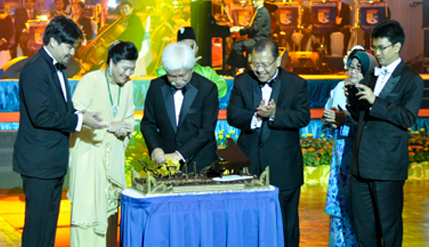 BANGI , 25 Jan 2014 – A right royal concert has been held by the National University of Malaysia (UKM) to celebrate the 66thbirthday of the Yang Di Pertuan Besar Negeri Sembilan Tuanku Muhriz Ibni Almarhum Tuanku Munawir, the UKM Chancellor. The gala night brought together 66 performers consisting of singers, musicians and dancers from among the students and UKM alumni. The songs were selected and adapted by Dato’ Dr Johari Salleh, a leading musician and Senior fellow of the UKM Centre For Learning and Accreditation, and Mohammad Fadzil Mohamad Adhan, officer at the cultural centre of the Student Services Department. Just before the music started, Tuanku Muhriz was presented a birthday cake which he cut, and also received a special gift. Vice-Chancellor Prof Datuk Dr Noor Azlan Ghazali, in his opening remarks, congratulated Tuanku Muhriz on his birthday and expressed hope for many more to come. Prof Noor Azlan said staff and students of UKM offered the concert as a token of appreciation to His Highness and consort Tunku Ampuan Tuanku Aishah Rohani Binti Tuanku Tengku Besar Mahmud. Among the performers was Tuanku Muhriz’s son, Tunku Zain Al-‘ Abdin who played the traditional song Tanah Pusaka on the piano. The night began to look upbeat with offerings from guest artiste famous jazz singer Datuk Sheila Majid, who sang the songs that are often associated with her; Dia, Aku Cinta Pada Mu and Sinaran, accompanied by the UKM orchestra. Another guest artist Mohammed Rauzan Alwi, also known as Roy serenaded the royals with Ku Impikan Bintang and All of Me. The orchestra also performed with the university dance troupe ARTISUKMA and a quartet from the PERMATApintar academy who gave their rendition of Putera Puteri and Setia Malaysia. The concert concluded with a cover and medley of Beatles songs by the orchestra and the dancers, who were quick on their feet with the Twist. Also present at the gala night were the UKM board of director, deans and lecturers of faculties and heads and senior officers of the administrative departments.